Odds are you will be facing Halloween candy at some point this week…maybe at the office, going out with your kids or at a Halloween party. 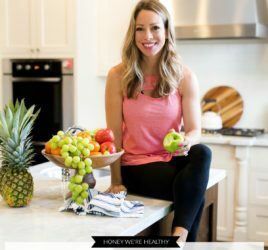 But, don’t stress – you don’t have to completely avoid the candy – just make better bad choices. I like this Halloween slideshow from “Eat This, Not That”. 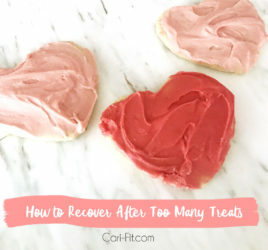 If pictures of candy make you drool too much, just read below for a recap! – Instead of Butterfinger, go with Milky Way and you’ll save about 25% of the calories and 50% of the fat. – Go for Tootsie Rolls instead of Twix candy bars because they have half the calories and only 1/4 of the fat. 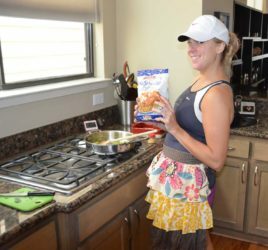 – Candy corn isn’t a healthy treat by any means, but it’s way better than Reese’s peanut butter pumpkins! If you choose candy corn you’ll consume only 70 calories (vs. 170) and 0g of Fat compared to 10g! 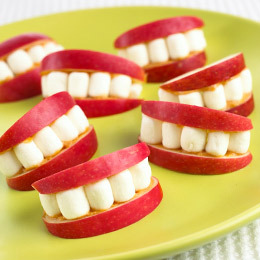 Other ideas for halloween treats include making these fun “teeth” with apples and marshmallows. 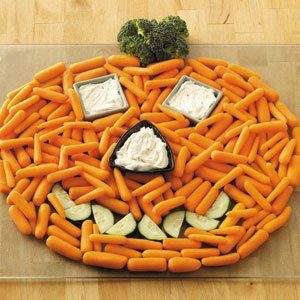 Or, you can go the veggie route and make a cute pumpkin crudité spread like the picture above. One of my other favorite fall treats is just an apple with a small amount of caramel for dipping.